Have you been thinking about purchasing a die-cut machine for your classroom? Readers of this blog and Learning magazine have access to a special coupon code for $125 off a Big Shot Pro shape-cutting system. Visit ellisoneducation.com/learn and use code E0512LM. The code is good through May 31, 2012. Don’t miss out; click here! Educate your students about their neighbors around the world and challenges they face with free materials from Heifer. Choose from activities, posters, books, games, videos, and much more. Download a kit or order a free kit by mail. Click here! Here’s another great option for free classroom materials: sign up for a free sampler kit from Sundance. 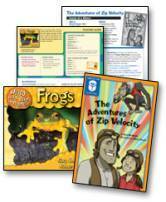 This kit includes materials from two award-winning programs to boost reading achievement and help below-level readers. You’ll receive student books, teacher’s guides, and scope and sequence guides or skills matrices for Laugh-Out-Loud Chapter Books (designed for grades 2-6) and Weird, Wild and Wonderful (designed for grades 2-5). Request yours; click here now! There’s a new Fancy Nancy series for older readers: Nancy Clancy, Super Sleuth. Students’ favorite fashionista plunges into chapter books for ages 7-10 with all the classic Fancy Nancy flair. Plus check out the new Fancy Nancy apps and sign up for a free quarterly e-newsletter filled with Fancy Nancy happenings. Click here to take a look! Get ready for the Common Core with resources from Sadlier! The Sadlier Phonics K-3 reading program has assessments built into every lesson and a flexible design to meet your students’ needs. View and print free samples! Click here! Spread the word about how WriteSteps helps your school meet Common Core standards. You could earn an iPad2! Get all of the details at www.WriteStepswriting.com/LM3. Be sure to check out the free 30-day trial! Harry’s Big Adventure immerses K-4 students in the sights and sounds of the wonderful world of bugs. Sponsored by Terminix, the site includes a free downloadable curriculum and the opportunity to invite a pest control professional to your classroom. Be sure to check out the Bugopedia. Click here now! 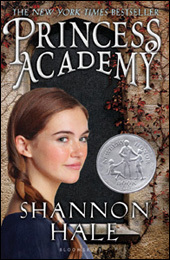 Have you and your students read the Newbery Honor book Princess Academy? Good news: now you can read it again—for free! Get a FREE digital book version of Princess Academy with a free teacher’s guide from Bloomsbury Children’s Books and NetGalley. Click here! And watch your bookstore shelves—the Princess Academy sequel, Palace of Stone, will be released in August. Go ahead, load up on all these fabulous offers. Don’t forget to submit a comment to our blog for your chance to WIN our prize! Wow! How can anyone choose just one of these amazing offers! If I was forced to choose just two, I would tout Sundance’s Laugh-Out-Loud Chapter and Weird, Wild and Wonderful books. The high interest books provide motivation to entice my students to read. The students and I both will benefit from the Sadlier Phonics K-3 reading program, with its alignment with the Common Core standards. I love that assessments and flexibility are integrated. I love them all but especially the Ellison die cut machine. I would love to win it. Sadly here they closed the professional resource centers for teachers. I miss the die cuts. Thanks for the great offers. My kiddos LOVE Fancy Nancy! Being a Reading Specialist I would have to pick the Sadlier Phonics K – 3 reading program. So many neat things! I am really interested in the Sundance books and the Fancy Nancy Clancy series. Thanks for the information! Fancy Nancy is the best. I cannot wait to hear my eight year old read the chapter book to me! I would love to winn the Ellison die cut! So many! I’m most excited about Sundance! I like the book Harry’s Big Adventure, the new Fancy Nancy books, and the Big Shot Pro-shape cutting system. There are many great offers. The Ellison machine would be very awesome! I miss being in a building where I have access to one. Love the Fancy Nancy series. The Ellison machine is my favorite. I would like to be able to use it to make bulletin board displays. The “Write Steps” offer is one I have my eye on. Electronic learning is definitely the wave of the future,so I’d like to get more “tech savy” and introduce iPad learning into my classroom. Also, I’m always intereseted in finding out about new writing philosophies and curriculum directions. Our students can NEVER get too much experience writing!! My daughter and I LOVE Fancy Clancy! I would love the Big Shot Pro for my classroom. I LOVE the Big Shot machine and it would be great to have one available for school!! I loved all of these great resources though…I went to most of the sites and requested free kits or more information right away!! I would love the Big Shot Pro for my classroom!